This year, we are celebrating the 15th Anniversary of Power Sports Inc.
Before setting up this company, with my strong passion, I flew to the United States to visit PowerBar Headquarter in California at that time, to directly ask for the permission to import and sell PowerBar products in Japan. After some years of grassroots efforts in the same passion, we finally received the honor to become the official importer and distributor of PowerBar brand for Japan in 2009. 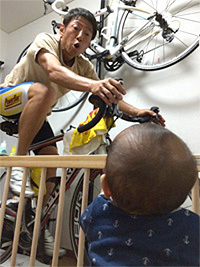 Ever since, we have given an enormous amount of effort for spreading the PowerBar brand in Japan - for 15 years straight. Within the limited amount of budget, we had to raise awareness of the brand, and to accomplish that, we’ve come up with various outdoor sports events. Through such events, we enjoyed the close relationships with participants, and explained the effectiveness and importance of PowerBar products to them directly on site. At the same time, by bringing hundreds and thousands of participants to the rural towns in deep mountains or on beautiful island beaches, we have supported district areas throughout Japan, where local people are troubled with serious depopulation. In order to communicate the enjoyment and greatness of outdoor sports, we then started publishing the outdoor sports specialized free-paper, which is distributed freely at sports-shop storefront. Last but not least, we then set up a seminar-house, where people can get the first chance to meet their unknown field of sports. Our Sales Group deals with distribution of PowerBar, Top Speed (energy/mineral supplement), New-HALE (sports taping) and other specialized goods, Event Group creates and operates outdoor sports events to promote all the goods we deal with, and OSJ (Outdoor Sports Japan) Group supports to promote and spread the fun, happiness, and technics for each outdoor sport. Here we are. Three groups tightly together forms our small but strong Power Sports Inc.
With the PowerBar business as a core of the company, we will continue to pursue our commitment to the future of outdoor sports in Japan. Copyright © owerSports Inc. All rights reserved.